In the run-up to the Super Bowl, Skittles has unleashed a rainbow of surprises. 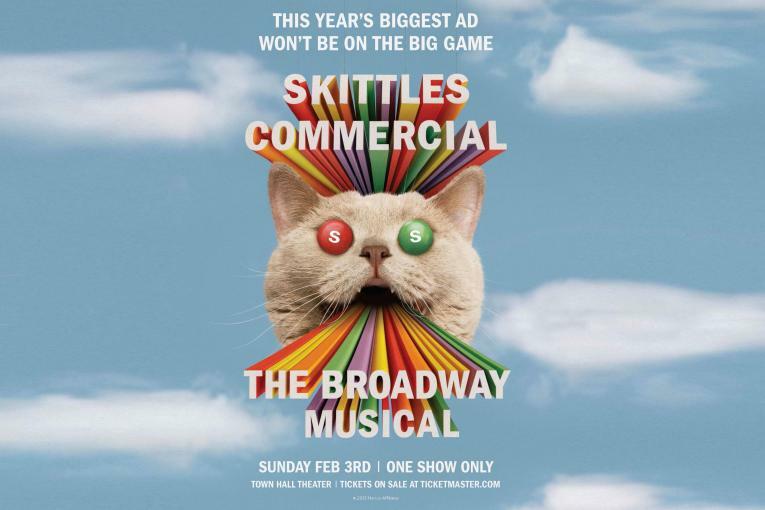 Following up on last year's ad that only one person was allowed to see, Skittle announced it was going to forgo advertising altogether this year and instead produce a Broadway musical that would run just once, right before the Big Game. The 30-minute show, entitled "Skittles Commercial: The Broadway Musical," would be produced by DDB Worldwide and written by Pulitzer-finalist playwright Will Eno. After that, Skittles announced the news that the star of the production would be Michael C. Hall, best known for playing a serial killer with a conscience on "Dexter." And now the candy brand may have dropped its biggest bombshell to date--that the whole production may be a big middle finger to advertising. A new behind-the-scenes music video, released today, suggests as much. 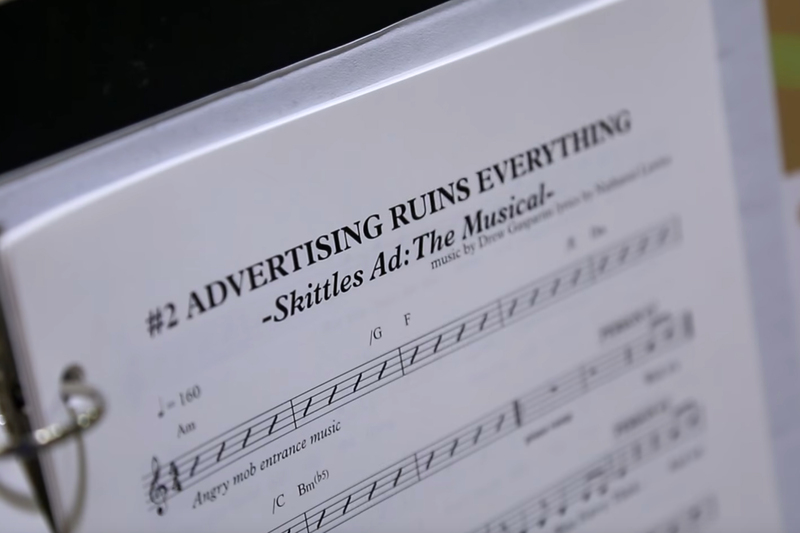 It captures Hall and others performing a tune from the show, "Advertising Ruins Everything," and the lyrics reveal that it will be a satirical exploration of what big game marketing is all about. "Companies like Skittles all need advertising. Look it up friends, it's just free enterprising. I don't see the problem with advertising." "It ruins the web and it ruins TV and it fills our inboxes with spam...There's nothing we hate more than each time you pay for targeted ads that show up on Instagram...It shows me how perfect a person can be and reminds me how perfect i'm not. I wish i was happier but I feel crappier with this new face that i've got." "What have I done? What if they're right? What if I ruined Broadway by being in this ad tonight? I will never make an ad again so long as I can act.. Because advertising, it ruins everything." While the lyrics are scathing, they're done with a wink—the video cuts in scenes of the cast chomping on Skittles and colorful candy pellets bouncing off the skin of a drum. Along with the tune, Skittles has released the show's entire original cast recording on Spotify. 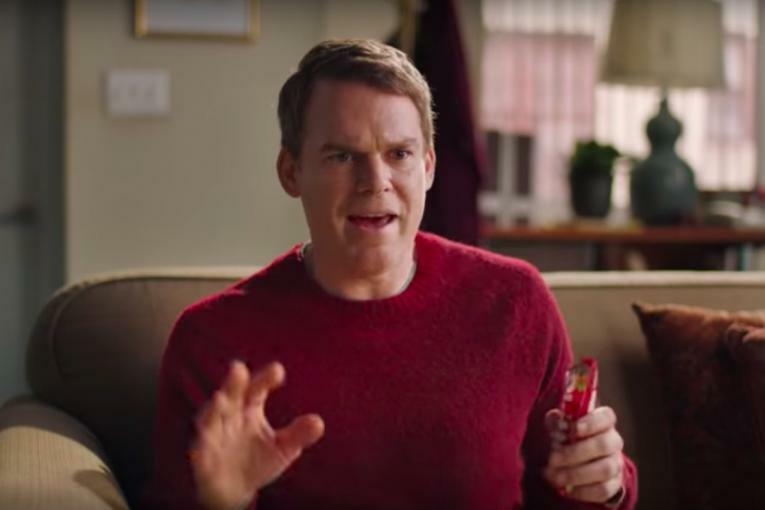 A second song is titled "This Might Have Been A Bad Idea," a third is named "This Definitely Was a Bad Idea," and then there's an additional four minute-track of Michael C. Hall munching on a bunch of Skittles. Altogether, they give a good outline of the game day show: Hall undergoes a crisis of conscience as he wears a cat costume and questions his whole decision to do this Skittles marketing stunt, contemplating how he may have doomed his entire acting career. His attitude then takes a turn for the positive--perhaps he'll do the late shows! Win a Tony! Meet the Dalai Lama! By the final act, Hall realizes it was "definitely a bad idea," then, somehow, dies, and ultimately becomes a Dickensian ghost, encumbered by large chains. "While it seems like an F.U. to advertising, obviously, we're an ad agency and Skittles is a brand. 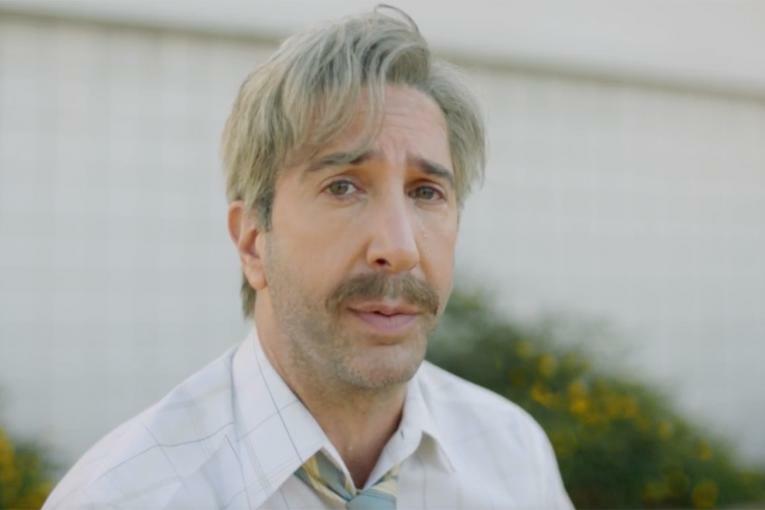 What the show really attempts to explore is the role of commercialism in America and the blurring lines of entertainment and marketing," says Ari Weiss, Chief Creative Officer of DDB North America, who also served as producer on the show. "What better time to explore this than the biggest marketing moment of the year. We chose Broadway and a musical because we wanted to be able to take a really interesting look at commercialism, marketing and entertainment and the intersection of what is and what isn't an ad." But what gives Skittles, a candy brand, the right to dive into such heady topics? For the Big Game, "we're so focused on these 30-second television commercials at a time when the way content is being consumes is so far beyond that," Weiss says. 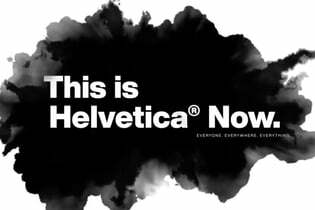 "So if you want to be at the forefront, it makes sense for this brand that targets 20-somethings to explore what's possible and ask the irreverent questions." As for the decision to take this to Broadway, "We saw some pretty great results from last year. 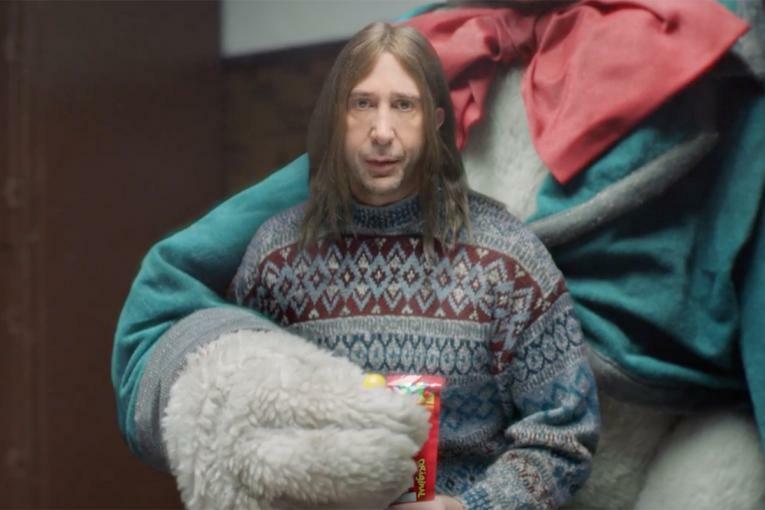 We thought we offered something that was truly, uniquely Skittles," Skittles' brand manager Debbie Litow told Ad Age when the campaign was first announced. Weiss cites the freedom a Broadway production afforded to dive into such a topic as challenging as the role of marketing today. "A musical allows you to explore this very heavy content in a lighthearted manner. If we were going to do this, we had to do it in an absurdly self-deprecating manner." Also, Broadway, over any other forum, seemed the most appropriate place. Platforms like Netflix, a feature film, or a TV show were "inherently more commercial," Weiss says. "Broadway felt to us the least commercial, and therefore, the most interesting place to explore." Once Weiss and his team decided a musical was the way to go, they skipped the usual production company bidding process and went straight to Smuggler, a top commercials production company that's also launched successful theater productions such as the stage adaptations of "Once" and "The Kids Stays in the Picture," as well as the Broadway comedy "Seminar." 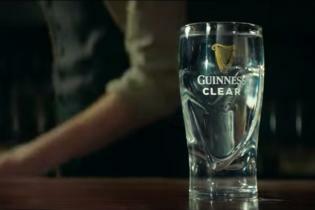 It was then that the DDB team realized that this ambitious idea might not be possible. "I kept telling Ari how hard this would be," said Smuggler co-founder Patrick Milling-Smith, who also served as producer on the Skittles show. "At first I didn't think it was actually going to happen because to pull off a live show is hard enough. 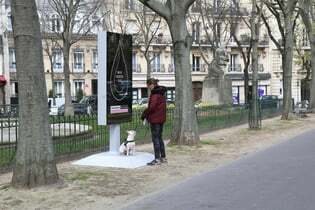 Also, I didn't want to be involved with an exploitative marketing stunt that was just ticking a box and half-assing a Broadway show." But Milling-Smith said the "intent and talent" were there--with DDB delivering an intriguing outline from its writer Nathaniel Lawlor, who had also penned last year's big game stunt. "As in commercials or film, when there's a good idea and great writing, it takes on its own momentum," Milling-Smith says. Once Smuggler signed on, Milling-Smith and his team approached writer Eno and Michael C. Hall, whom they had recently worked with on a series pilot. Once the play's book had been written, the Smuggler team brought on director Sarah Benson. "I saw a play of hers, 'An Octoroon,' and it was the most innovative, moving thing I'd seen in a decade," Milling-Smith says. "The production design blew me away—and they pulled it off on a low budget." The biggest obstacle, Milling-Smith says, was securing the theater for the production. Weiss insisted that the show had to happen on Broadway--not anywhere else, despite Milling-Smith's suggestions to do elsewhere--like the Super Bowl turf of Atlanta. The show is running right as Broadway is going into a new season. "So when you're a theater house owner, you'd rather take a booking for a potential three to five months rather than a one-day thing," Milling-Smith says." Through a combination of persistence and serendipity the Smuggler team finally secured The Town Hall on 43rd street, and the show started building in earnest from then. Weiss adds the whole production was unlike any commercial project. "It was a very uniquely organic process, things build over time, you bring people in, stories change, scripts evolve. It's a little bit like being on a river, the water takes you along and people come aboard the boat."